The same ingredient used to bake your favorite muffin recipe can also be an effective part of your daily dental health regimen. Sodium bicarbonate, or sodium hydrogen carbonate, commonly called baking soda, is added to commercially available toothpastes to enhance the cleaning and whitening powers of the products. 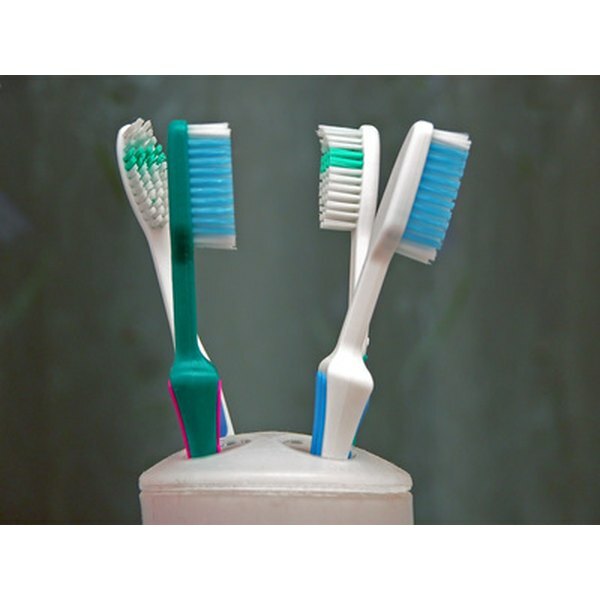 It also can be used alone as a safe and effective means to promote oral health. Use sodium bicarbonate as an aid to healthy oral hygiene in four ways. Sodium bicarbonate is a water-soluble mineral that is a safe and effective cleanser of tooth enamel. Use the compound to efficiently scrub away unsightly plaque from dental surfaces and gums to aid in the prevention of gum disease. Sodium bicarbonate is a soft mineral that is less abrasive than other dental cleaning agents such as dicalcium phosphate or hydrated silica, and is therefore able to clean your teeth gently and with low abrasion, says Dentist.net. Sodium bicarbonate is a natural buffer that maintains a healthy pH in your mouth to promote a clean and fresh oral environment. It effectively neutralizes the volatile sulfur compounds, or VSCs, that cause malodorous breath. It also has antibacterial properties towards many periodontal pathogens. Use a warm solution containing 1/2 tsp. of baking soda in 8 oz. of water to create an effective oral rinse with mouth freshening, antiseptic properties, advises Family Gentle Dental Care. Have your teeth become stained by prolonged use of coffee, tea or cigarettes? A study reported by the National Institutes of Health showed that dentifrices containing sodium bicarbonate reduced dental stain to a greater degree than other commercially available products. Significant increases in tooth whiteness were observed in volunteers by week 12 of the study, indicating that sodium bicarbonate can be more effective at reducing your dental stains than standard silica-based products. Cancer patients often experience oral infection, nausea and vomiting, mucositis and burning mouth sensations while undergoing treatment options such as radiation or chemotherapy. If you are scheduled to participate in any such treatment programs, use warm, dilute solutions of sodium bicarbonate to soothe the mucous membranes of your mouth, neutralize excess acids and to serve as an antiemetic. The American Dental Association recommends a mouth rinse made of 1/4 tsp. of baking soda and 1/8 tsp. of salt in one cup of warm water. Use the rinse several times a day to combat oral symptoms promoted by cancer treatment regimens. Pamela Lee Hill is a chemist and writer who enjoys working from her home in the beautiful Ozark Mountains. She has written science articles for LIVESTRONG and has published research in "Chemical Communications" and "Inorganic Chemistry." Hill holds a doctorate in inorganic chemistry from Kansas State University.